I found a cookbook for grilling recipes at Chapters on sale for $10, and this recipe was an adaptation of one of the recipes in the cookbook. I adjusted it to match the ingredients I had on hand. I roasted these in the oven, but I'm sure they'd be great on the barbecue as well! Preheat oven to 400 degrees F. Line a baking sheet with aluminum foil. Coat the foil in canola oil spray. Place chicken drumsticks evenly spaced on greased foil. In a small bowl, combine all remaining ingredients and whisk together. 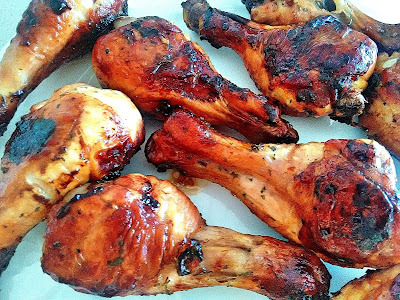 Brush sauce onto drumsticks. Turn the drumsticks over and coat the other side. Bake for 20 minutes, remove from oven, and turn them over. Place back in the oven for 20 more minutes.